Monday, February 18 marked the beginning of a very special week for FFA members around the nation. The week of February 18 was FFA Week, a week celebrated by The National FFA Organization in which FFA is promoted throughout schools and communities, while members appreciate the organization of which they are a part. Zane Trace FFA Chapter celebrated FFA week with contests during lunch, a bowling trip, FFA Trivia during school, a radio interview, and even a Harlem Shake video. FFA was promoted throughout the community on Monday, when members of the Zane Trace FFA Week Committee shared information about FFA Week and the chapter’s activities in an interview on WBEX radio station. Tuesday through Thursday, while school was in session, the FFA shared their fun with the rest of the school. Activities included contests at lunch such as pie eating, potato sack races, and relay races. As part of FFA Week, the Greenville FFA Chapter planned a trip to Valley’s Edge Snow Tubing in New Paris, Ohio. The trip was held on Monday, February 17th, of FFA Week and on an off day from school for the chapter members. Members met on the Monday afternoon for two hours of fun on the slopes. Even though it was not snowing outside, members still had fun on the slick slope riding down the hill in tubes and ending up in the stop area. Members also had an opportunity to snack in the comfort of the lodge while they warmed up and tried to dry out a little. All in all, it was a fun filled afternoon. Fifteen members were in attendance for the snow tubing trip! On Saturday, February 16 seven members of the Miami East FFA Chapter competed in the State Food Science and Technology and State Agricultural Communications Contests hosted at The Ohio State University. Food Science and Technology Team members were Tanner Church, Kelly Rindler, Sarah Pyers, and Shane Richardson. The team placed 2nd in the state and earned a banner for the agriculture classroom. Tanner Church was the highest placing individual from Miami East, placing 3rd overall and earned a $1000 scholarship to major in Food Science at Ohio State. During the contest the team members were asked to complete a product development scenario in which they calculated the nutritional facts for a new food product and design a new package. Also they completed an aroma identification section, took a test on their knowledge of food science, responded to a mock customer complaint letter, identified sanitation errors in the food industry, and completed a taste sensory test. 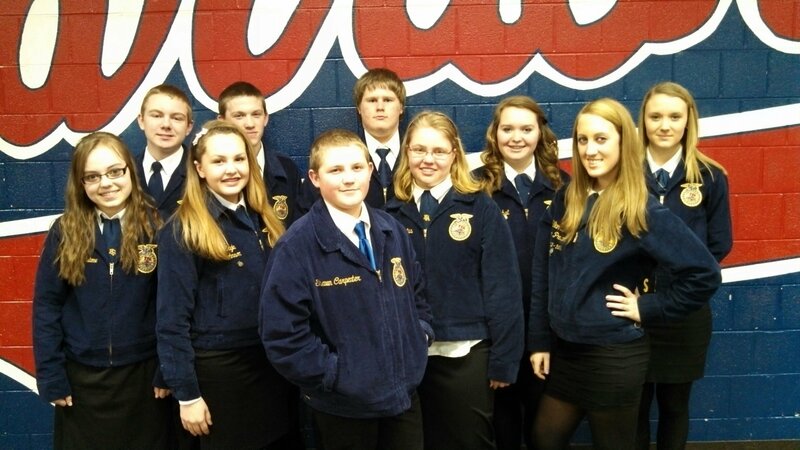 Recently, members of the Zane Trace FFA Chapter participated in various career development events. These events are designed to help students learn skills related to careers in the field of agriculture, natural resources and food science while having fun in a competition setting. The three events that Zane Trace students entered during the month of February included: Ag Sales, Agriculture and Industrial Diagnostics and Food Science. 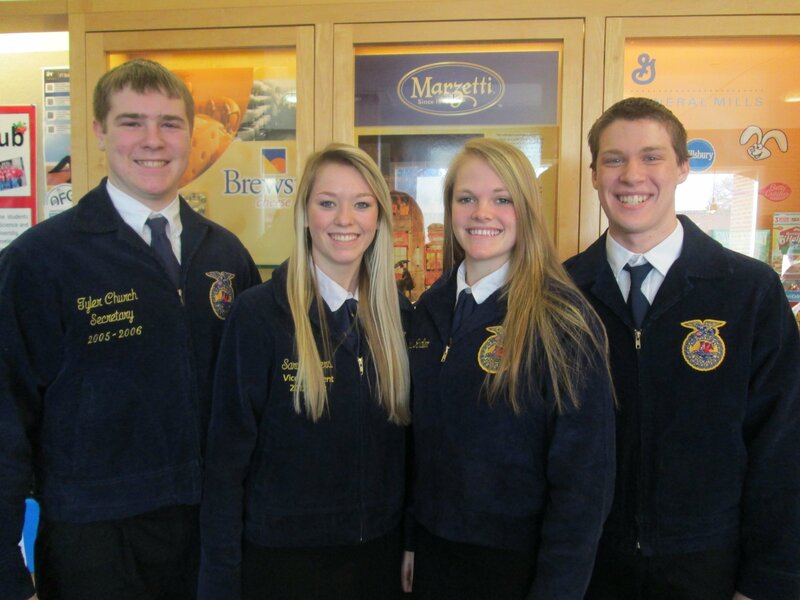 The Ag Sales team consisted of Senior Audrey Hoey and Freshmen Emily McCain, Bobby Orr and Jacob Boggioni. Each member designed a product related to agriculture and created a sales plan for that product. During the contest held on February 5th each member completed a sales presentation to a judge and answered questions about their product. They also participated in a practicum over customer relations and an online test over agriculture sales topics and tactics. The team placed 10th in District 7. State FFA leaders across U.S. attend National Agriculture Day training in D.C.
Thirty state FFA officers – mostly college students – from throughout the country join agricultural students from 4-H, the Agriculture Future for America and the Student National Agrimarketing association in Washington, D.C., to experience leadership and advocacy training, meet congressional leaders and help raise awareness of agriculture and its impact on our nation’s society and economy among Washington policymakers. Leadership training at the National 4-H Center in Chevy Chase, Md., is led by experts representing the National FFA Organization, National 4-H, Agriculture Council of America, Farm Credit, John Deere, Walmart, National Association of Farm Broadcasting, American Farm Bureau Federation, Land O’ Lakes, the U.S. Forest Service and more. During their time in D.C., FFA members and agricultural students are participating in idea exchange groups, visit congressional leaders at Capitol Hill, undergo media training and take a nighttime tour of the nation’s capital. Franklin, Tenn. –– Journal Communications and the National FFA Organization announce the launch of an FFA New Horizons magazine mobile app for Apple, Android and Kindle Fire devices. The app is free and available in the iTunes store, Google Play store and Amazon marketplace. FFA New Horizons magazine is the member publication for the National FFA Organization. The magazine is published by Journal Communications and delivered quarterly to more than 500,000 student members, agriculture educators and FFA alumni. The app features content from the FFA New Horizons magazine, including stories about FFA members’ achievements, agriculture facts, information about careers in agriculture, and issues facing the agriculture industry and community. Additional features include a mobile-friendly design with vertical scrolling for readability, pop-up captions and info boxes containing additional information, live links throughout, embedded video within advertisements and photo slideshows. The app will be updated quarterly with new content. “A mobile version of the magazine is a logical choice for the publication’s audience, which is mostly 15-21 year olds and very technologically savvy,” says FFA New Horizons magazine editor Kim Holmberg. 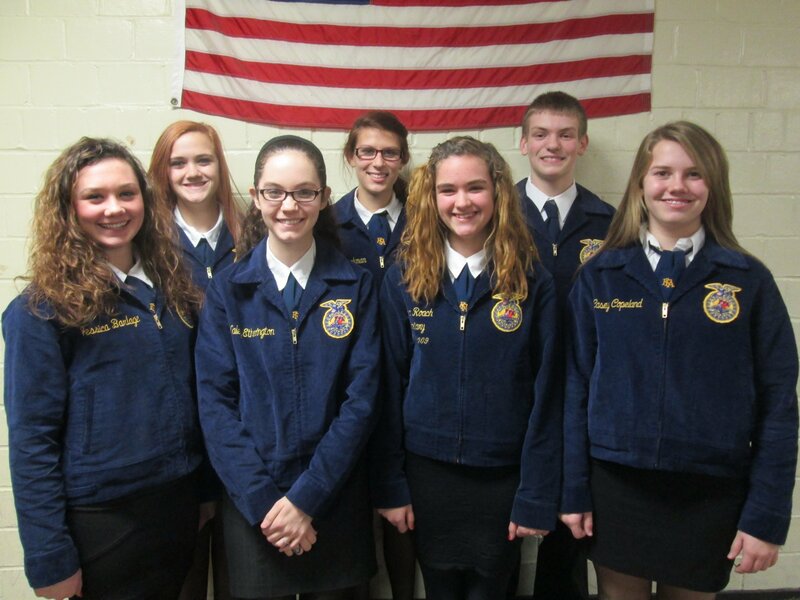 Seven members of the Miami East FFA Chapter competed in the Sub-district Public Speaking Contest at Anna High School. Schools competing in the contest included: Botkins, Anna, Fort Loramie, Miami East, Jackson Center, and Fairlawn. Olivia Edgell competed in the Extemporaneous Speaking Contest. She was given 30 minutes to prepare a chosen topic, present the speech, and then answer questions. She pulled a topic on soil conservation. She placed fourth out of five competitors and earned a gold rating. “World Food Crisis – Going to Bed Hungry but I’m not in Trouble” was the title of Kendra Beckman speech in the Advanced Prepared Speaking Contest. She wrote, memorized, presented, and answered questions on the world’s crisis of clean water and safe food and the role that America’s farmers play in the solution. She placed 5th. Casey Copeland completed in the Beginning Prepared Public Speaking Contest with her speech entitled, “Antibiotics – Miracle Cure or Problem.” She placed 4th in the contest. Hiland FFA members participated in the District 8 FFA Job Interview Contest. Contest was held at Buckeye Career Center. Members who participated in this contest were Jessica Davis, Preston Shamp, and Rachelle Yoder. This contest is designed to help students demonstrate skills needed to seek employment in all areas of agriculture. Prior to the contest members were to create a resume and cover letter. There are three parts to the contest. First, members fill out their applications for the position they are applying for. Then FFA members have a mock interview where they will be asked a series of questions about the job they are applying for. Finally, after the interview is completed, members then type up their follow-up letter. Different jobs that members could apply for were Buckeye Landscaping Intern Position, Roots Poultry, TSC Tractor Supply Co., Oak Ridge Farms, McCabe Outdoor Power, and Sandusky Humane Society. Jessica Davis applied for the Buckeye Landscaping Intern Position, Rachelle Yoder applied for Oak Ridge Farms, and Preston Shamp applied for McCabe Outdoor Power. The top four finalists in each proficiency area will be interviewed at the Ohio FFA State Convention and winners will be announced during the sessions. Below are the finalists listed in their respective area. The Greenville FFA Agricultural and Industrial Diagnostics judging team of Brady Garber and Patrick Schmitmeyer placed 5th at Darke County contest. The contest was held at Koenig Equipment and employees of Koenig’s ran the contest for teams from Darke County FFA Chapters. The Tractor Troubleshooting contest involves a team of two members. The team had 4 tractors that were bugged with problems and the team had to identify the bug and then fix the problem. Examples of problems that can be found in the tractors are bad fuses, broken electrical wiring, blown lights, safety switches disconnected, obstructed air flow, and others. It challenges the team members to work in a systematic method to troubleshoot the problem, utilize computers to help in identifying the problem and to correct it. The team members also have a written test to take concerning similar topics. Members have 20 minutes to complete each of the stations of the contest. Ten members of the Southeastern FFA have spent the past month memorizing and organizing speeches and developed resumes and cover letters in preparation for two competitions in public speaking and job interview. 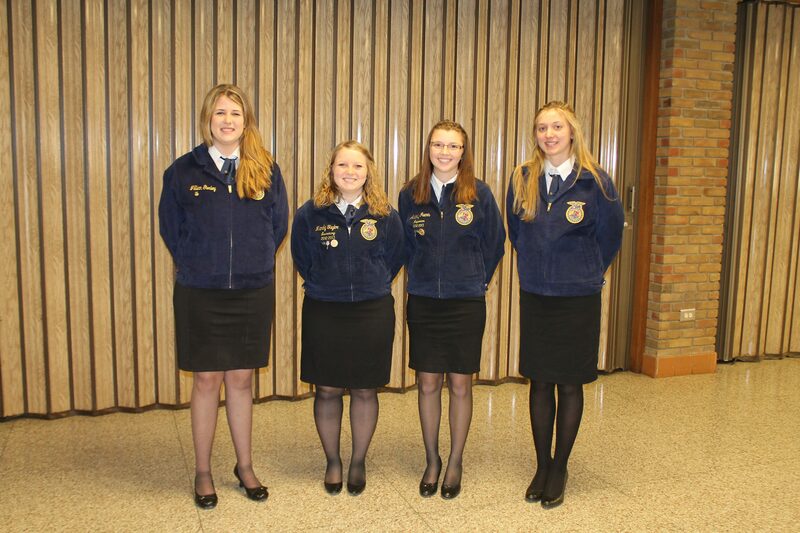 Danielle Augustus, Haley Conway and Jillian Edwards competed in the junior division of job interview at the county level, with Haley placing second, Jillian placing sixth and Danielle placing eighth. Haley went on to the sub-district level, placing sixth in the junior division. Cory Knox, Brandon Zerkle and Kyle James competed in the sophomore division of job interview where Cory placed ninth, Kyle placed tenth and Brandon placed eleventh in the largest division of the contest. Cory went on to place third at sub-district and will advance to the district level. Finally, in the freshman division, Miranda B. placed seond, Stephanie Whetstone placed eleventh and Shawn Carpenter placed twelfth. Miranda competed at the sub-district level, placing second and will also advance to the district level. The Miami East-MVCTC FFA Chapter recently competed in the District 5 Evaluations of the Ohio FFA Association at Upper Valley Career Center in Piqua. Several members of the chapter worked extra hard on their Supervised Agricultural Experience (SAE) record books to prepare their applications for awards and degrees. Three 2012-13 Chapter Officers that submitted books for review. Lauren Williams submitted the Secretary’s Book and earned a gold rating (100 out of 100). Kendra Beckman submitted the Treasurer’s Book and earned a gold rating (100 out of 100). Rebekah Eidemiller submitted the Reporter’s Book and earned a gold rating (100 out of 100). Lauren, Kendra and Rebekah will be recognized at the State FFA Convention in May. 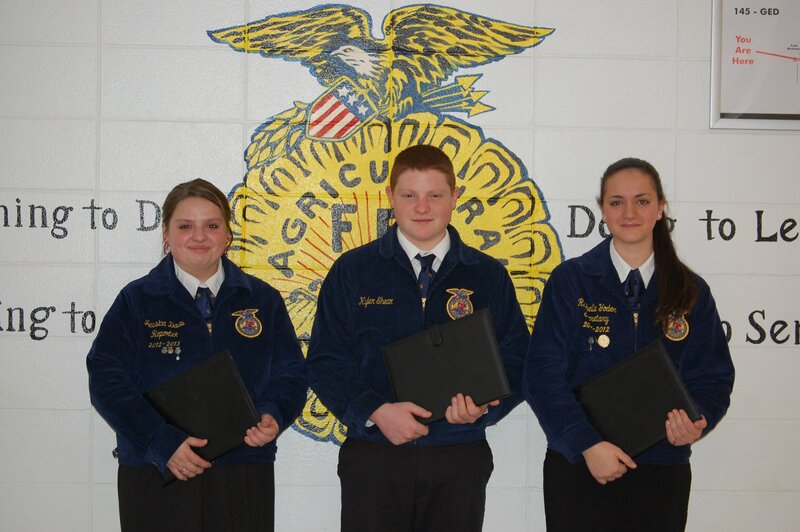 Senior Sarah Pyers and Juniors Daniel Bodenmiller, Kolin Bendickson, and Lindsey Roeth applied for the State FFA Degree. All applications were reviewed and submitted to the state evaluation for further review. Emily Johnson applied for the award of Star State in Agribusiness with her business of selling market sheep to sheep producers. On February 11th, the West Holmes FFA sent members to compete at District Job Interview contest at Buckeye Career Center. Four members participated in four divisions. In division I Jillian Gurley placed 2nd, in division II Shyann Kick placed 1st, in division III Mandy Taylor placed 1st, and in division IV Audrey Ivers placed 5th. The divisions were age categories that the people are placed in. Prior to the contest, members prepare by making a portfolio that includes personal information, a cover letter, and resume. During the actual contest, members are interviewed by judges and then follow up the interview with a thank you letter. Shyann and Mandy will be competing at the State Contest on March 2nd. Good Job to all of our members! REYNOLDSBURG, Ohio – Local FFA chapters can now apply for their chance to receive grants to help fund community development projects through the 2013 Agricultural and Rural Community Outreach Program. 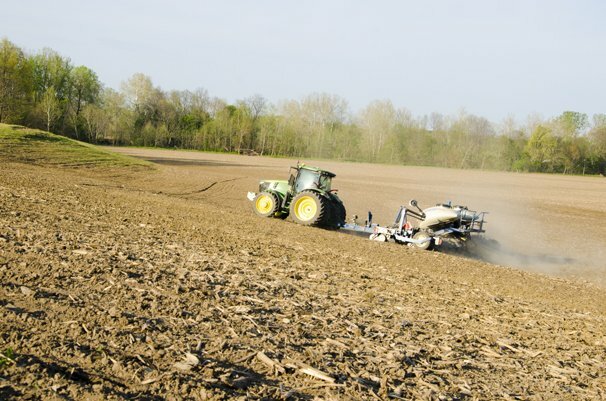 The program, jointly administered by the Ohio FFA Foundation, Ohio FFA Association and the Ohio Department of Agriculture, will award grants to chapters with top-ranking projects. Local FFA chapters can submit project proposals until May 15 to the Ohio FFA Foundation. A committee will then select projects to receive grant funds ranging from $750 to $2,500. The Howard G. Buffet Foundation, Archer Daniels Midland (ADM), and Monsanto have partnered with the National FFA Organization to raise awareness about the perennial problem of hunger. The National FFA’s pilot program awarded the Madison Plains FFA with a $2,000 grant to educate their community about hunger issues both locally and worldwide. This grant allowed the chapter to hold the “Invest 2 Fight Hunger” Benefit Dinner on Feb. 21. 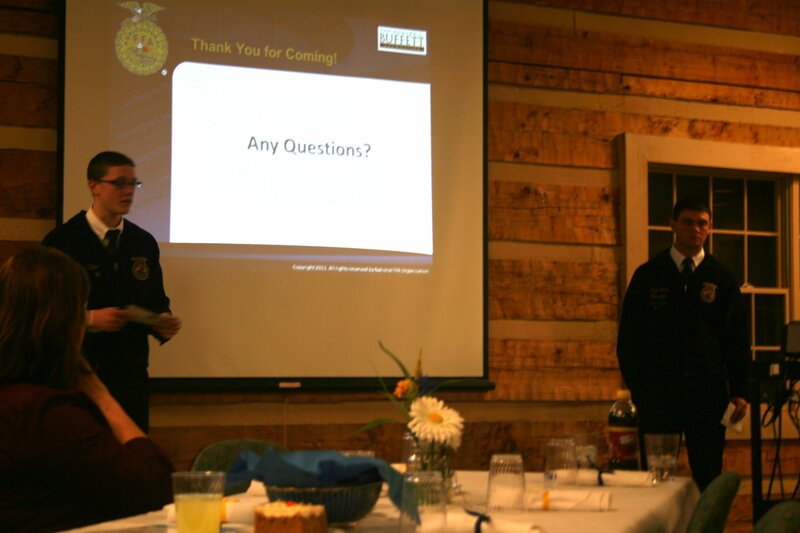 Thirty attendees at the dinner learned about hunger issues from presenters from ADM, Mid-Ohio Foodbank, and the Madison Plains FFA. Ryan Metzger, Merchandizer for ADM, told attendees about the “Invest an Acre” program that ADM and Monsanto conduct. This program allows farmers the opportunity to donate a portion of their profit to their local food bank. Monsanto then doubles the donation made by the local farmer. “In the first year we were able to make a large contribution because of donations from farmers like many of you,” Metzger said. 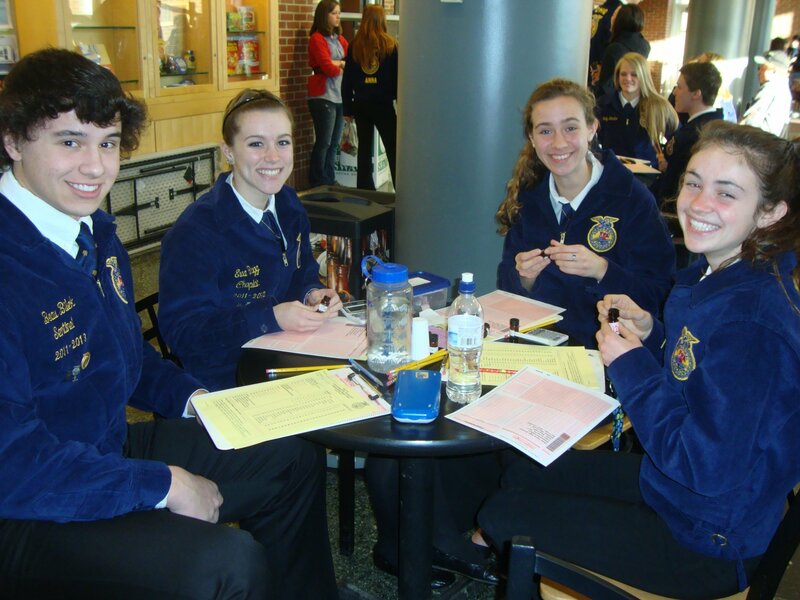 The Ohio Ag Net & Ohio’s Country Journal is looking for three Ohio FFA members to help serve as student reporters at the 2013 Ohio FFA Convention. You’ll get the opportunity to help cover the convention and work alongside our news staff that includes Matt Reese, Heather Hetterick, Dale Minyo and Ty Higgins. Ever wonder what its like to do our job? Here’s your chance! 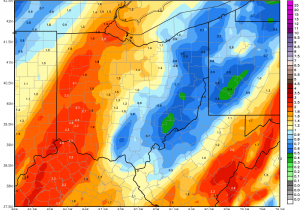 The live coverage of the Ohio FFA Convention will be posted on www.ocj.com. At the end of each session share your commentary of what happened in each session in a video to recap the session. You must be attending both the State FFA Convention May 3rd and 4th. Submit no more than a 2 minute video sharing your qualifications and why you should be selected. Dave Snyder of Ashland was appointed as the National FFA Superintendent of the Milk Quality and Products career development event effective in 2013. The first official responsibility of this position was to attend the National CDE Superintendent Meeting in Louisville, Kentucky. There are 27 Career Development Events held at the National level each year hosting contestants of teams from all state in the United States. Snyder served as interim superintendent for the year in 2012. It is the responsibility of the superintendent to attend the January superintendent meeting, and conduct the summer organizational meeting for that particular committee in charge of the Milk Quality and Products CDE. Here the decisions are made concerning organization, preparation, implementation, and revisions of the contest so that the contest can be conducted at the National FFA Convention each year. The 2012 national contest was held in Indianapolis, IN and will be moved to Louisville, KY in 2013. Nine FFA members of the Mohawk FFA Chapter received their Chapter Degrees on January 14, at Mohawk School. The recipients were Meghan Chaffee, Austin Morter, Austin Harris, Aaron Vasquez-Miller, Bri Thiery, Kelsea Fleming, Kevin Lonsway, Morgan Sniffen, and Caitlin Huffman. The meal was catered by Special Occasions. Other FFA members that attended the ceremony were Kayla Draper who gave the introduction, Emily Daniel who led the invocation, Jarred Shellhouse who was the President for the ceremony and Deon Morter who did the closing comments. The speaker for the evening was Gary Klopfenstein, the District 4 FFA President. Congratulations to those who received their chapter degree! The February 2013 Miami East FFA Member of the Month is Andrew Kowalak. Andrew is the son of Mark and Gretchen Kowalak of Troy. Andrew was chosen because of his recent involvement in various FFA activities. In February Andrew will be participating in the first-ever Ohio Youth Capitol Challenge with youth involved in 4-H, FFA, and Farm Bureau. Andrew will be attending the conference to become a prepared and active citizen within his community. Additionally, Andrew is applying for a District Proficiency in the area of Forestry Management and Products. Andrew owns and operates Logo Logs in which he carves logos into forest products and sells them via social media outlets. In two years of business he has sold over 70 Logo Logs. Every month of the school year the Miami East FFA will select a student to be the FFA Member of the Month. The officer team will nominate one student that has been actively involved in the FFA chapter, school and community activities. The West Holmes FFA had their freshmen compete in the Online Greenhand Quiz on January 24th. The team placed 49th out of 122 teams and 1,649 participates. Individually, Lyndsey Davis placed 199th, Jason Jenkins placed 282nd, Matt Gardner placed 375th, Jillian Gurley placed 455th, Carter Smith placed 502nd, Justin Lorentz placed 567th, Tory Eggers placed 594th, Riley Brannon placed 615th, Katlyn Hamner placed 640nd, Gabe Armstrong placed 654th, Dylan Harsh placed 668th, Paige Miller placed 736th, Moose Workman placed 799th, Cole Woods placed 873rd, Coven Mullet placed 888th, Tyler Grassbaugh was 890th, Racheal Yerian placed 910th, Ariel Bickel placed 918th, Ethan Fair placed 922nd, Tanner Walker placed 963rd, Mystique Martin placed 1013th, Hannah Schlegel placed 1030th, Michael Parker placed 1037th, William Hughes placed 1041st, Sierra Wengerd placed 1066th, Patrick Schlabach placed 1118th, Alex Miller placed 1317th, Devon Little placed 1333rd, Stasia Callahan placed 1356th, Kristina Metcalf placed 1412th, Brooke Underwood placed 1426th, Bethany Underwood placed 1447th, Sammy McClain placed 1524th, Brandy Haddock placed 1599th, and Jeared Miller placed 1616th.